Depending on which online payment system you are using, administrators can process credit card payments from admin view in Wild Apricot. For example, a member might call you with their credit card details and asks you to renew his or her membership. Processing of credit card payments by administrators is not supported for PayPal Standard. Administrators can only process credit card payments related to a specific invoice. Payments cannot be charged to an individual's account, only to an invoice. Administrators can process both one-time and recurring payments. Recurring payments will be set up in the member's payment system profile, and Wild Apricot's audit log will display a corresponding entry. For example, setting up a recurring Authorize.Net payment would be recorded in the log as Authorize.net customer profile for recurring payment created. Profile ID= ******. To process a payment related to an invoice, you first have to find the invoice with a balance due. 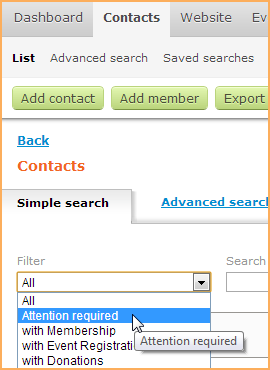 To search for unpaid invoices, click the List option under the Contacts menu and select Attention required from the Filter drop-down. To open the unpaid invoice, click the Record payment button. On the screen that appears, click the Charge credit card button. If the Charge credit card button is missing or grayed out, it is because we do not support processing credit card payments by administrators for your online payment system. On the next screen, enter the credit card details and click the Pay button. A confirmation message will appear after the payment has been successfully processed. If you are not using one of the payment systems that support credit card processing in admin view, there are still a couple of ways an administrator can process a credit card payment for a member. Email the invoice to yourself, and then view it online using the View online link in the invoice. This will allow you to pay any invoice online without logging in first. For this to work, make sure you include the View online link in the invoice (see Customizing invoices). Log into the site as the member and then pay the invoice. If you don't know the member's password, you could always ask the member to give it to you, or you can change it.